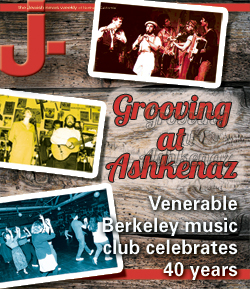 Grooving at Ashkenaz: Venerable Berkeley music club celebrates 40 years – J. Even if they’ve never set foot inside the club, locals going past the intersection of San Pablo and Gilman avenues in Berkeley are no doubt accustomed to the sight of Ashkenaz Music & Dance Community Center — its pointed roof, its weathered wooden facade, the illuminated peace sign. Many likely don’t know it was modeled after an Eastern European synagogue. After 40 years in business, that’s just one of many stories contained within the club’s barnlike walls. On a recent Sunday afternoon at the club, Allen King was teaching Israeli dancing to a crowd of about 40, as he’s been doing at Ashkenaz since the 1970s. The previous night, the venue was packed for an indie band that bills itself as “an unholy union of Otis Redding and Hank Williams.” Tuesday would bring zydeco; Wednesday, Balkan folk dance. So it goes at the family-friendly club known throughout the Bay Area as much for its openness and its commitment to coexistence as for its eclectic music. At any given event, visitors to Ashkenaz can peruse a wall featuring promotional posters from four decades — evidence of the politics, the passions and the parties that went into making the club, and Berkeley’s music scene, what it is today. “Only in Berkeley would someone dream up a utopian nightclub,” the San Francisco Chronicle’s retired pop culture critic Joel Selvin told the East Bay Express in March. Celebrating its anniversary with the theme “Dancing for Peace,” Ashkenaz is more than a fixture of Berkeley’s live music and dance scene. For the regulars and employees who have long called it home — sometimes literally — it’s been a clubhouse, a living room, a spiritual space, a hotbed of social activism, a matchmaker. It’s a time capsule of the creative surge that took place in the 1970s in folk and world music, and a place to celebrate the myriad genres and subcultures that evolved from it. The club also has been especially important to a broad swath of the Bay Area’s Jewish community. But perhaps more than anything, the extended family that holds Ashkenaz dear is a testament to what happens when a community center takes that role seriously — opening its doors to anyone and everyone with a song to play, a dance to try or an idea to share. Ashkenaz was founded in 1973 by David Nadel, a pacifist and human rights activist who died tragically in 1996 after being shot outside the club. Nadel had moved from Southern California to attend U.C. Berkeley in 1960. He was as tireless as he was compassionate, say those who knew him best, with an innate sense of social justice that drove most everything he did — including multiple protests that led to multiple arrests — such as his legal battle with U.C. Berkeley over its plan to convert People’s Park into tennis courts. Nadel also loved to dance: After college he joined the Westwind International Folk Ensemble, a troupe dedicated to the burgeoning interest in Balkan, Turkish and Eastern European folk dance. In 1973, following the closure of a favorite folk dance club on San Pablo Avenue (Nadel lived right around the corner), he felt strongly that the scene there couldn’t die. So he pulled together a group of friends from the dance community and put a down payment on a shipping warehouse at the corner of Gilman and San Pablo. He also put his woodworking skills to use in designing the building’s facade and interiors, which he wanted to look like the wooden synagogues of Eastern Europe — hence the name, which pays homage to Nadel’s Ashkenazi Jewish background. Though he wasn’t religiously observant, Nadel’s deeply ingrained sense of justice and passion for causes he believed in were big parts of his Jewish identity, says Susan Felix, a former board member and regular at Ashkenaz since the 1970s. He also regularly turned the venue over to Jewish groups and congregations, including Aquarian Minyan, the Berkeley-based Jewish Renewal community, which has held its annual Purim Spiel at Ashkenaz for 30 years. Achi Ben Shalom, a friend of Nadel’s who specializes in Israeli dance music, still plays that party every year. Nadel also was a controversial figure in the Jewish community at times for his ultra-liberal views on domestic issues as well his vocal criticism of Israel’s policies affecting Palestinians in the ’80s and early ’90s. His political views often melded with his goals for the club. Nadel was a vegetarian, a major supporter of Food Not Bombs (he often gave the group, which distributes free vegetarian meals, meeting space at Ashkenaz) and “was talking about [freeing] Nelson Mandela before just about anyone else was,” said one friend. The photocopied dance and performance calendars for the club, in the days before the Internet, were accompanied by a sort of political screed-of-the-month handwritten by Nadel, according to King. “That was definitely David,” the dance teacher recalls. “Some people liked it and some people hated it, depending on the month and on who he was attacking … but we all loved him.” Following Nadel’s death, Ashkenaz staff created a font styled on his handwriting to use on promotional materials. 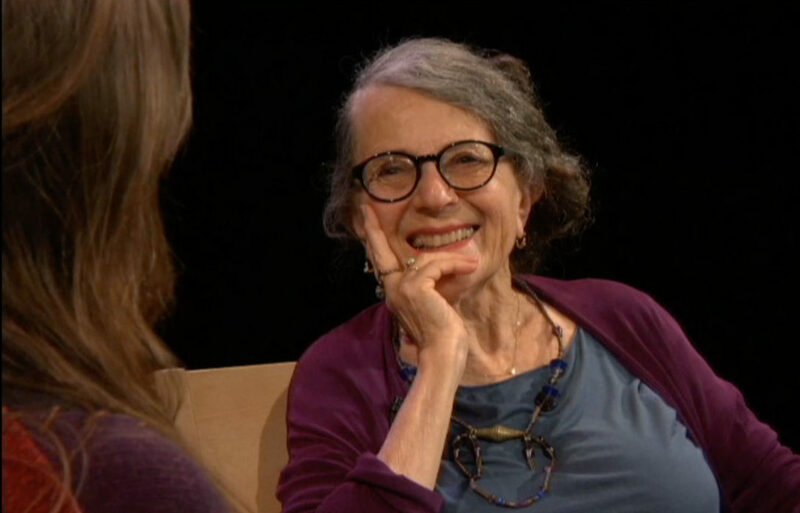 At the time Felix met Nadel, she was the director of a Berkeley nonprofit that helped to find housing for the homeless. “For several years, he would give me a handful of passes to events and say, ‘Try to give these to the most depressed people, the folks who really need this most … and please, don’t mention to anyone that I’m doing this,’ ” she recalls. Bringing together people of all backgrounds — ethnicities, faiths and dance styles — was central to Nadel’s vision. Over the two decades he ran the club, he lived in a room above the venue as he crafted it into a hotspot for all kinds of dance and live music: Balkan, Cajun, zydeco, West African highlife, Brazilian samba, afrobeat, calypso, blues, reggae, salsa, swing and more. “His original idea was that you could bring people together and solve so many of the world’s problems just by dancing and listening to music, in a social and political way,” board member Gary Skupa told the San Jose Mercury News. Ashkenaz has always been nonsmoking, and it has always been welcoming to all ages. More than anything, say longtime patrons, it has always been a good party. Lise Liepman, a member of the Balkan band Edessa, has been involved with the club since the ’70s, when she was in college. She and her husband (and fellow band member) George Chittenden had their first date there; they and a few other friends later bought a house in Berkeley in part because of its location — a short nine-block walk from Ashkenaz. Ironically, it was one of the few customers Nadel did kick out that tragically ended his life. On Dec. 19, 1996, he ejected a drunk, rowdy man who had been harassing female patrons; the man later came back with a gun and shot the club owner in the head, just outside the door of Ashkenaz. Nadel died of his wounds in the hospital two days later. He was 50. “His death was just a tragedy for everybody,” says King. And yet, he says, “David lives on in everything Ashkenaz does.” In the midst of their mourning, his friends knew they couldn’t let the place Nadel loved so dearly die with him. A group of dancers, musicians, activists and other Ashkenaz community members raised money to form a nonprofit arts organization that still owns and runs Ashkenaz today. At the first fundraising danceathon after Nadel was killed, Liepman remembers going to put her coat and purse down in the corner of the cozy wooden club and finding it already crowded with other people’s things. Current manager Larry Chin first set foot in Ashkenaz in 1985, and by all accounts has kept the place running true to Nadel’s vision since becoming involved after his death. Liepman says he’s done a “remarkable” job. There were whispers about Nadel’s tragic history repeating itself earlier this year when, just after midnight on March 16, Chin and another employee, Stan Ellis, were shot during an armed robbery. Both men survived; Chin, who was shot in the back of the head, has been taking time off the past few months. One thing is clear: The folks who love Ashkenaz are committed to keeping it running, no matter what. Seven nights a week, Ashkenaz hosts concerts, dance classes, educational events and more, drawing its customer base from both the old-timers who’ve been coming since Nadel’s days, as well as younger fans of music and dance that are hard to find at more mainstream Bay Area rock clubs. A typical lineup on the calendar this month included a ska/rock band, an African drumming night, a Balkan folk dance lesson and the club’s third annual tribute to Jerry Garcia, with upward of 12 acts taking the stage. On a Friday or Saturday night, it’s not uncommon to see a line out the door and down San Pablo Avenue, with patrons ranging in age from 5 to 75. For the club’s anniversary celebration kickoff in March, the lineup included former Grateful Dead percussionist Mickey Hart and his band, the Black Mountain Boys, the West African Highlife Band, the Cajun group BeauSoleil, reggae master Everton Blender and Bay Area jazz and blues veteran Lavay Smith. For the younger set, it also featured Alison Faith Levy’s Big Time Tot Rock and the folk group Octopretzel, which frequently plays at Jewish venues. When Susan Felix was named Berkeley’s first art ambassador in 2004, she was asked to come up with an idea that represented the epitome of Berkeley. “I described an evening at Ashkenaz, dancing with the West African Highlife Band with this totally mixed crowd of people,” she recalls, “mixed racially, in terms of age, some people in strapless dresses and high heels and some people in jeans and sweats, everyone grooving together, all kinds of lines being crossed.